Participatory climate-service and information session, Tanzania. Credit, C. Schubert, CCAFS. Participatory research emerged as an approach to create appropriate technology for smallholder farmers and as a means to improve the conventional technology development process. Participatory research is a “collaborative process of research, education and action that is explicitly oriented towards social transformation.” Participatory approaches to research are now widely accepted because they are focused not only improving farming practices but also with issues of empowerment. They recognize the importance of all stakeholders in the generation and dissemination of knowledge, contrary to past approaches where the needs and preferences of the main beneficiaries were often overlooked. Participatory research attempts to close the gap between the needs of the beneficiaries and the outcomes of the programmes that traditionally have been misaligned. As a result, participatory research has increased adoption rates of new methods or technologies by involving farmers in the design and execution of the research programme. Higher levels of adoption are attributed to the increased sense of ownership over the product or process as well as the reassurance that the outcomes are intended to suit the beneficiary’s needs and preferences. According to the Food and Agriculture Organisation (FAO), “ecology-based knowledge-intensive farming systems rely on the knowledge of ecosystem services much more than high external-input systems.”  Local and indigenous knowledge can be very important in the identification of solutions to context specific challenges. For example, to improve crop varieties, farmers need to be involved in both the identification of breeding objectives and the selection process. They also need to understand the environmental conditions and challenges and how they can play a vital role in identifying traits that are most needed in the improved varieties. Typically, participatory plant breeding results in higher and faster rates of adoption of improved crop varieties. Approaches to agricultural research have evolved over the last 50 years, from a top down transfer of technology model, to Farming Systems Research (FSR) to Farmer First Research (FFR). 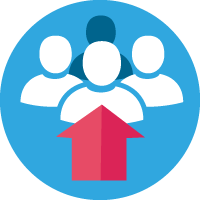 More recently, this has evolved again to a more participatory and multi-stakeholder research approach. Work within the CGIAR and many other organisations is leading to a wider recognition of the need for multi-stakeholder processes. However, many challenge the belief that participation is unequivocally good, arguing that efforts embracing participation maintain existing power relationships, hidden behind the rhetoric of participation. Involving local smallholder farmers in scientific research on a wider scale is more challenging than using participatory methods for village or regional level data gathering primarily because the participatory process is very time consuming. The integration of local knowledge with scientific knowledge can also be challenging. Farmers are expected to do research at their own cost and are therefore subjected to the risk of negative financial return, generally measured by the trade-off in labour time allocation. 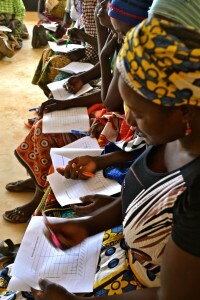 As the benefits to participatory research – empowerment, equity, and capacity building – are difficult to measure and cost effectiveness is equally challenging to assess, the method may be best suited for application by public organizations such as national agricultural research systems, government extension services or NGOs. Chambers, R, Pacey, A & Thrupp, LA (eds.) 1989, Farmer First: Farmer Innovation and Agricultural Research, Intermediate Technology Publications, Exeter. Kindon, S, Pain, R & Kesby, M 2007, ‘Connecting people, participation and place’ in eds. S. Kindon, R. Pain & M Kesby, Participatory Action Research Approaches and Methods: connection people, participation and place, Routledge, New York, pp. 1-5. Ajeigbe, HA & Dashiell, K 2010, Participatory research extension approach: N2 Africa extension method, International Institute of Tropical Agriculture (IITA), Ibadan. Probst, K, Hagmann, J, Fernandez, M, & Ashby, JA 2003, Understanding participatory research in the context of natural resource management: paradigms, approaches and typologies, Overseas development institute (ODI) & Agricultural research & extension network (AgREN), London. Food and Agriculture Organization of the United Nations (FAO) 2012, Greening the Economy with Agriculture, FAO, Rome. Food and Agriculture Organization of the United Nations (FAO) 2011, Save and Grow: A Policymaker's Guide to Sustainable Intensification of Smallholder Crop Production. FAO, Rome. Research Into Use (no date), Participatory crop improvement: Rice in Ghana, Available from: <http://www.researchintouse.com/nrk/RIUinfo/PF/PSP06.htm> [10 July 2015]. Food and Agriculture Organization of the United Nations (FAO) 2011, The State of Food and Agriculture: Women in agriculture – Closing the gender gap for development, FAO, Rome. Cornwall, A & Jewkes, R 1995, ‘What is participatory research?’ Social Science & Medicine, vol. 41, no. 12, pp. 1667-1676. Cooke, B & Kothari, U (eds.) 2001, Participation: The new tyranny? Zed Books Ltd., New York. Ponzio, C, Gangatharan, R & Neri, D 2013, ‘The potential and limitations of farmer participatory research in organic agriculture: A review’ African Journal of Agricultural Research, vol. 8, no. 32, pp. 4285-4292. Push-pull technology in action. Credit, ICIPE. Push-pull entails mixing plants that repel insect pests (“push”) and planting diversionary trap plants around a crop perimeter that attracts the pests away from the crop (“pull”). In this case, stemborers are attracted to Napier grass (Pennisetum purpureum), a trap plant, and are repelled from the main cereal crop using Desmodium, a legume ‎intercrop. Desmodium roots exude a chemical that effectively controls the parasitic Striga weed by preventing germination. Desmodium also improves soil fertility through nitrogen fixation, natural mulching, improved biomass and control of erosion. As part of the research and development strategy, the International Centre of Insect Physiology and Ecology (ICIPE) directly involved thousands of smallholder farmers to test and experience the push–pull technology on their own farms. 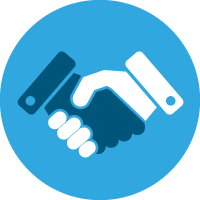 As a result mutual trust developed and the resulting improved communication process led to faster adoption of the technology. 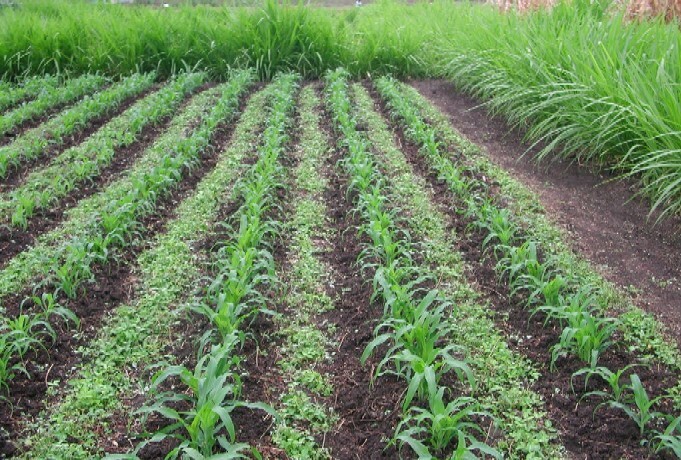 ‘Push-pull technology’ is now an innovative system of soil, pest and weed management on mixed cereal- livestock farms that has now been adopted by approximately 30,000 smallholders in Kenya, Uganda and Tanzania. Khan, Z, Midega, C, Pittchar, J, Pickett, J & Bruce, T 2011, ‘Push-pull technology: a conservation agriculture approach for integrated management of insect pests, weeds and soil health in Africa’ International Journal of Agricultural Sustainability, vol. 9 no. 1 pp. 162-170. Wijeratna, A 2012, Fed Up: Now’s the time to invest in agroecology, Act!onaid Available from: <http://www.actionaid.org/sites/files/actionaid/ifsn_fed_up.pdf> [29 June 2015]. 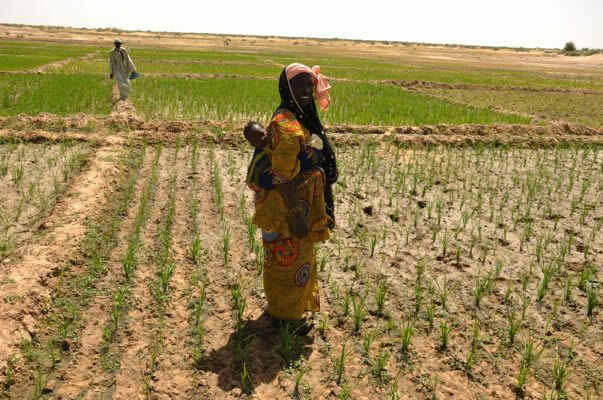 A ‘dry’ SRI field in Mali. Credit, Cornell University. The system of rice intensification (SRI) has increased yields by transforming rice cultivation practices, without the need for expensive and unnecessary inputs. The central principles of SRI advocate that soils should be kept moist rather than continuously saturated; rice plants should be relatively widely ‎spaced and planted singularly; and seedlings should be transplanted when young to avoid trauma to roots and to minimize transplant shock. Africare worked with local farmers to adapt SRI principles to local conditions and evaluate the potential of SRI to increase rice yields. The project began informally, with a single volunteer farmer and no external funding. At the end of the farming season, SRI plots had outperformed control plots and surrounding fields, yielding 66% more than control plots and 87% more than surrounding rice fields. SRI plots used substantially fewer seeds per hectare, 30% less inorganic fertiliser and 10% less irrigation water. SRI plots yielded between 2.1 and 2.4 times more revenue than the control and neighbouring rice plots. Africare spearheaded the wider spread of SRI principles in the region, and organised farmer exchange visits and community-led knowledge transfer and experimentation. Communities themselves decided how many farmers would test SRI, and there was limited technical supervision to enable farmers to experiment on their own. Cornell University (no date), SRI International Network and Resources Centre: SRI Methodologies, Available from: <http://sri.ciifad.cornell.edu/aboutsri/methods/index.html> [29 June 2015]. Styger, E, Aboubacrine, G, Attaher, MA & Uphoff, N 2011, ‘The system of rice intensification as a sustainable agricultural innovation: introducing, adaptive and scaling up of a system of rice intensification practices in the Timbuktu region of Mali’ International Journal of Agricultural Sustainability, vol. 9 no. 1, pp. 67-75. A popular new variety of maize produced by crossing high-yielding and local varieties. Credit, M. DeFreese, CIMMYT. The Fund for the Improvement and Adoption of African Crops (FIACC) programme is intended to increase farmers’ choice in the development of ‎improved seed varieties. This is done by crop breeders and farmers working together to include farmer preferences in the variety selection process. FIACC adopts a decentralised approach to crop improvement that brings breeding work closer to farmers, with testing amongst farmers for selection and an emphasis on agroecological diversity. The breeders use local varieties in combination with modern, higher-yielding lines to achieve better adaptation to local environments. New varieties are tested with government regulation processes involving on-farm trials and demonstrations on farmers’ fields to authorize the seeds for commercial use by seed enterprises. FIACC uses breeding stock available through international channels such as the Global Agricultural Research Partnership (CGIAR) and local landraces. As of 2010, 100 new varieties have been produced through the programme using conventional breeding methods. The release of new varieties in 2010 surpassed the target by 50% (60 new varieties released compared with a target of 40). 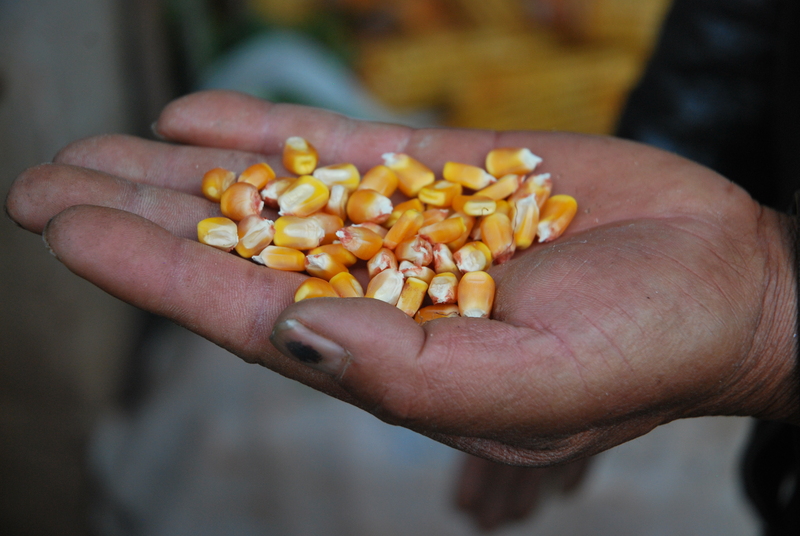 FIAAC’s objective is to develop and release 1,300 new crop varieties over 10 years. The African Centre for Biosafety 2012, ‘Alliance for a Green Revolution (AGRA): Laying the Ground for the Commercialisation of African Agriculture’ Agriculture, Energy and Liveliihood Series, The African Centre For Boisafety, Melville.